Home » Authors » Analog Devices Inc., Norwood, Mass. 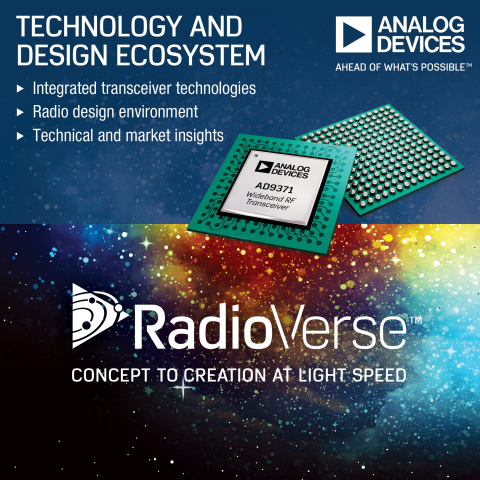 Analog Devices Inc. (ADI) announced the release of an extensive RF amplifier library of Sys-Parameters models for Keysight Technologies Inc.’s Genesys RF simulation and synthesis software. Analog Devices Inc. introduced a phased-locked loop (PLL) synthesizer with integrated voltage-controlled oscillator (VCO) that allows mobile network operators to improve cellular base station performance and the quality of wireless service. The new ADF4355 PLL with VCO synthesizer operates up to 6.8 GHz, a frequency band that allows significant margin to industry's current carrier frequencies. Analog Devices Inc. announced it is the primary sponsor and founding member of "Solve," a multi-faceted program organized by the Massachusetts Institute of Technology (MIT) that convenes thought leaders, researchers, students, and change agents to identify and implement technology-centered solutions to the most difficult challenges of our times. Analog Devices Inc., a global leader in high-performance semiconductors for signal processing applications, announced that Bruce R. Evans has been elected as a director of the company. Analog Devices Inc. a global leader in high-performance semiconductors for signal processing applications, announced the promotion of John Hassett to senior vice president of worldwide manufacturing. View All Articles by Analog Devices Inc., Norwood, Mass.